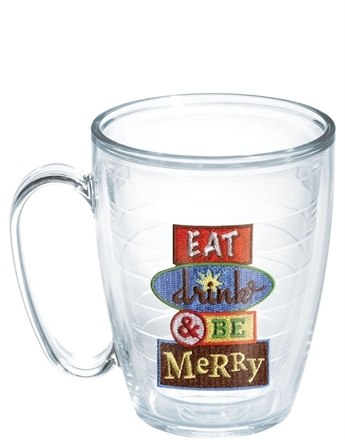 Tervis is a company that that I have been wanting to try their products for some time now. I first started seeing them on Peanut Butter Fingers blog when she put her smoothie in them. They have tons of different designs and sizes to choose from so everyone can get something they like. For my review, I chose to review the deer cup and a cup with my initials on it. For part of my dad's Christmas present, I gave him the deer cup and he loved it since he is a hunter. The cups work for both hot and cold products which is great! In the summer, I can keep my smoothie cold in this mug and in the winter on the way to work, I can keep my tea hot. They are microwave, dishwasher, and freezer safe. I love mine! Something else neat that I learned while writing this review is that the company first started in Detroit, MI which is very near to where I am from. Since then, they have moved to North Venice, FL. My favorite feature about Tervis is that they have a lifetime guarantee. These cups/mugs will not chip, crack, shatter, etc. If they do, you can get your mug replaced. Now that is some great customer service! I love Tervis I ahve 3 or 4 of them and I use them all the time!